MailerMailer's Email Marketing Metrics Report uncovers the top words businesses use to entice readers to open their messages. Marketers and subscribers can learn more about this and other email trends in this report, which summarizes the data of over 300 million messages sent in the second half of 2008. MailerMailer releases its ninth bi-annual Email Marketing Metrics Report which highlights the latest trends in email marketing. Among the many takeaways, readers can learn the most frequently-seen terms marketers used in email subject lines to attract people to open their messages. They can also view, as well as obtain, a copy of a word cloud depicting the popularity of these words to use on their own blog or website. 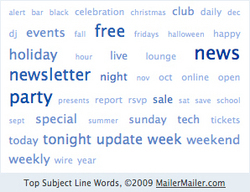 Both the publication and the word cloud can be downloaded for free at http://www.mailermailer.com/metrics.rwp. In light of evolving technology and consumer preferences, the report also provides instructional material for designing mobile-friendly emails. With more people viewing email on Blackberrys, iPhones and other hand-held devices every day, there is an increasing need for marketers to pay attention to this segment of their target audience. The 38-page report is filled with charts, tips and data that provides businesses with relevant information to help them adjust their email marketing strategy to cater to their audience's changing needs. "The key to leading winning campaigns in the midst of a recession is to move with the ebb and flow of changing subscriber preferences," says MailerMailer CEO Raj Khera. "Our report covers many important trends marketers need to be aware of to make strategic decisions in running their campaigns." This report covers the performance data of over 300 million emails from 21 different industries from July to December 2008. MailerMailer is a leading do-it-yourself email list management provider. Equipped with the latest email marketing technology, such as zip code radius targeting, image hosting and the fetch HTML from website feature, MailerMailer allows easy creation of professional email newsletters and campaigns. MailerMailer is part of a series of sites run by Khera Communications, which includes discussion group management tool, DiscussThis, and small business resource site, MoreBusiness.com. A free trial of this email marketing service is available at http://www.mailermailer.com. 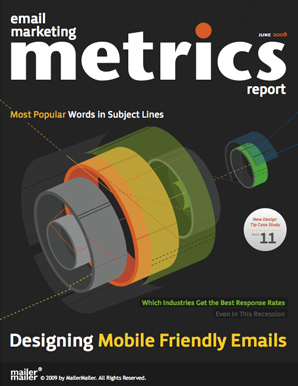 Email Marketing Metrics ReportThe cover to MailerMailer's latest report on email trends. 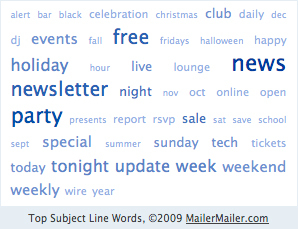 Most popular subject line termsMailerMailer's newest Email Marketing Metrics Report reveals top words used in subject lines.